When the Mexican Cafe in Auckland claims to offer the “experience [of] real Mexican food,” we suspect that they in fact mean the “experience of only half-way acceptable Tex-Mex and overpriced drinks served in a kitschy and utterly stereotyped atmosphere.” The designers of Epcot Center’s Mexico exhibit–complete with Mayan temple and a river ride–would be jealous of this place. With vibrant colors highlighting the walls, overflowing crepe paper, Christmas lights, a large tile mosaic, and the extensive collection of Mexican airport souvenirs, this place looks to have fallen out of a mariachi band’s closet. Yes, the atmosphere wins the Mexican Cafe points, and we’ve been told by at least two drunk people that the 11pm Friday salsa dancing is choice, but unfortunately we can’t say the same about the nachos. 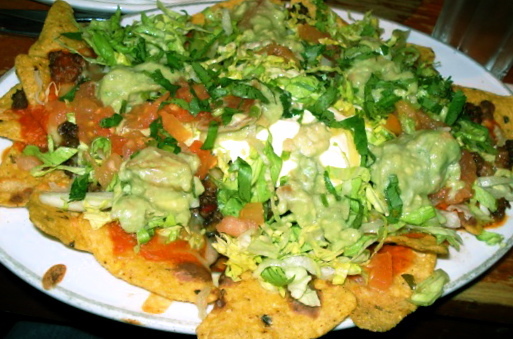 Appearance: (6) we’ve heard that New Zealand is a very green country, and these nachos were no exception. Riddled with lettuce (alas the day! ), guacamole, and cilantro, Mexican Cafe nachos were like a taco salad with extra chips. The sea of sour cream certainly didn’t help the cause, though we did appreciate the sprinkle of color offered by the tomatoes. Distribution: (5) we wanted to give distribution a higher rating, but unfortunately we were too busy scouring the plate for some small speck of cheese. The lettuce, guac, and sour cream played their parts well, blending together to coat the plate in a viscous, pale green mess. How appetizing. Yet there we found perhaps one measly strand of clear cheese. While not nearly so MIA, but still sadly lacking, we also had trouble finding these mythical beans the menu touted. There might have been three. Four would be pushing it. Not like it mattered–they didn’t taste like anything anyway. Price: (2) we actually wanted to take points off for price, but since we’re feeling generous and giddy from a day of hiking, we decided to settle for the second lowest price score Nacho Patrol has ever awarded (it’s hard to beat El Paso’s woeful score of 1). Mexican Cafe charges an even $20 (USD $13.40) for chicken or beef “Extra Special Nachos,” which are handily finished by one person. Factor in credit card fees and the suddenly rising exchange rate, and this particular plate left a sizable dent in our New Zealand nacho budget (which we can assure you is ample). Overall: 20/40. We really wanted these nachos to be successful. After all, this is THE place to go in Auckland for Mexican food. Yet in the end, all our prayers at the alter Our Lady of Guadeloupe proved to be naught, leaving us to conclude that one should come to the Mexican Cafe for the salsa dance and leave shortly thereafter. 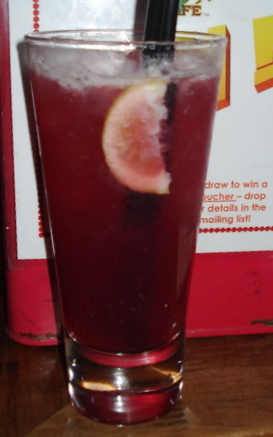 On side note, and one of interest to Smasharita, don’t waste your money on the margaritas. In fact, don’t waste your money at any bar in the Auckland area because they more than likely are giving you half-shots and watering down the liquor. NSD $13 for the Sunshine Margarita which, while refreshing, was just about as weak as dishwater and tasted vaguely like fresh cut grass. Border Cafe, oh HOW WE MISS YOU! Tags: Auckland, Foreign Correspondant, Margaritas, New Zealand, Random Rants, Salsa dance, Vague racism, Viva Mexico! Yikes! Is that how those nachos looked when they showed up or was it after the earthquake? Looks like they got in a fight with an industrial leaf blower. At least all that lettuce will keep you regular. Great review as always, Nacho Patrol. Just FYI, Jalapeño’s Mexican Grill® will open soon in Auckland City @ 12B O’Connell Street. You’ll be able to try authentic Mexican tacos, nachos, burritos, quesadillas, tinga tostadas, enchiladas, chilaquiles, etc. The tortillas and nachos will be cooked daily on-site with authentic Mexican corn flour on a Mexican tortilla machine. Keep an eye for the opening as it will be very soon.